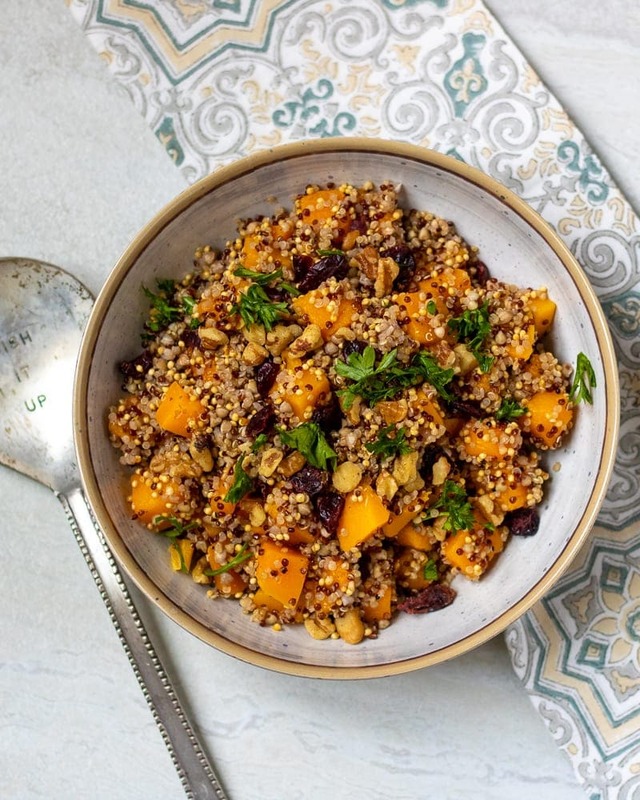 Harvest Quinoa Salad: This fall Quinoa Salad is made with roasted butternut squash, dried cranberries and a pumpkin vinaigrette for a delicious gluten-free and vegan Fall Side Dish. Years ago I attended a HUGE Thanksgiving Pot-Luck that featured dozens of dishes. I happened to bring my homemade applesauce and mashed potatoes. But the one that stuck out to me was a wild rice salad that had a pumpkin dressing and slightly sweet and savory at the same time. I fell in love with it. Pumpkin vinaigrette–genius!! Over the years, I have modified the butternut squash rice salad and turned it into this Harvest Quinoa Salad. This fall Quinoa Salad is full of fall flavors and makes a perfect side dish or a hearty meatless entree. This salad is a little bit sweet, a little bit savory and full of various textures. This quinoa salad is complete thanks to a pumpkin vinaigrette. It is savory, yet a bit sweet from the maple syrup. It is a unique dressing that makes this simple Vegan Quinoa Salad something spectacular. I like to cook my quinoa in the Instant Pot, however, you can easily cook on the stove-top. 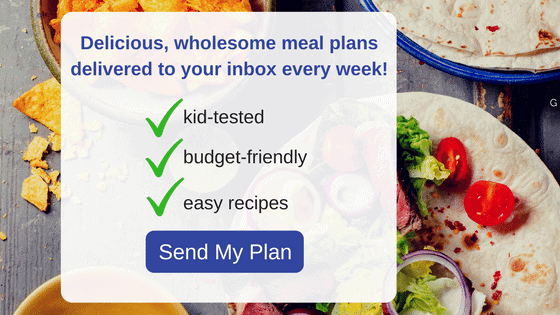 Any variety of quinoa works. To add flavor to the quinoa, cook in vegetable or chicken stock. I love the crisp edges and the sweetness that is developed with butternut squash is roasted. Cut butternut squash into 1/2 inch chunks. Season with oil and salt and pepper. Roast at 425 degrees for 25 minutes. You can also just used a bag of steamed butternut squash and skip the step of roasting squash for this recipe. Mix together the pumpkin puree, maple syrup, apple cider vinegar, and spices together. Slowly add in the olive oil, whisking well. Toss the dressing over the prepared quinoa. Gently toss the squash into the salad. Add in the dried cranberries and nuts. The original inspiration for this simple side dish started with a base of wild rice, but I opt for quinoa instead. Quinoa is quicker to cook than wild rice and is higher in protein and fiber. Feel free to use wild rice in place of quinoa if desired. This quinoa salad needs a crunch factor, but if pecans are not your thing, feel free to use walnut, almonds, or pumpkin seeds for texture. This Harvest Quinoa Salad is fine served warm but best after being refrigerated for a couple hours. Fall Quinoa Salad will last in the fridge for up to 5 days. 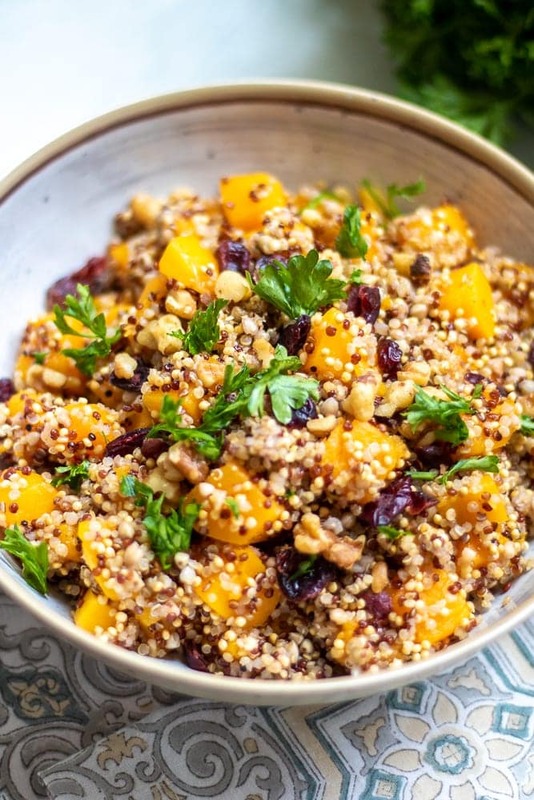 A simple fall quinoa salad with cranberries with roasted squash and tangy pumpkin dressing. Toss squash chunks with 1-2 teaspoons oil and roast at 425 for 25 minutes, or fork tender and starting to crisp up around edges. Cool before tossing in salad. Bring the vegetable stock, seasoned salt and quinoa to a boil and reduce to a simmer for about 20 minutes, or until quinoa is tender and liquid is absorbed. Or cook quinoa in instant pot. Prepare the dressing by mixing the pumpkin puree, vinegar, syrup, oil, salt, pepper, and thyme together. Toss the quinoa with the dressing and then add the squash, cranberries, nuts, and seeds and fold into the quinoa gently. Refrigerate for at least 4 hours until flavors have had time to marry together. Mmmm such a comforting dish! Thanks Rachel! It hits every note on the palate!! this looks amazing! Just put it on my “to make” list!! Awesome Brittany! Let me know how you like it! 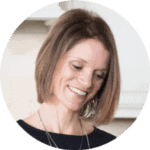 This is fantastic–i told my SIL I would bring a quinoa side dish and here it is! Thank you. Score!! 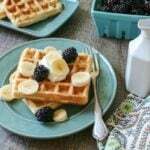 I am happy to supply your recipe for you! Let me know how you all enjoy it!! It is so good on any fall salad–no need to limit it to just this dish! I adore all these flavors here! And the addition of butternut squash! Pinned! Thanks Meg. This salad truly celebrates some of the best flavors of fall. Absolutely!! They add the perfect crunch and salty crunch. This salad is the perfect combination of flavors for sure. YUM! Such a perfect fall salad. I love getting pumpkin flavors in the dressing rather than just the salad! So perfect!